Recent release “The Desane Odyssey” from Page Publishing author Monroe Williams is the tale of a Black, American artist whose art is criticized for not being in touch with the oppressed world of which it depicts. The artist, named Jeremiah, sets out to experience the world outside of his limited purview. Monroe Williams, a veteran and graphic designer, has completed his new book “The Desane Odyssey”: a gripping and potent tale of self-discovery, love, and the fragility of circumstances. Published by New York City-based Page Publishing, Monroe Williams’s emotional tale explores Jeremiah's quest to discover his roots in order to fully understand the subjects he depicts in his art. However, Jeremiah is not alone because others are on an illicit and perilous journey, which leads them unerringly to him and threatens to destroy all that he has achieved. He also finds a woman who becomes his salvation and he comes dangerously close to losing her. 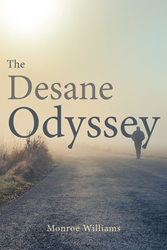 Readers who wish to experience this inspiring work can purchase “The Desane Odyssey” at bookstores everywhere, or online at the Apple iTunes store, Amazon, Google Play or Barnes and Noble.